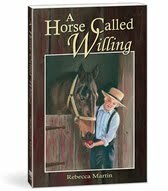 When Lady's carefree gallop across the pasture ended in disaster, the family needed another horse. That's how Willing arrived at their farm. Willing was a model of . . . stubbornness. Through the adventures, struggles, and surprises that followed, Joel learned about willingness, getting along with others, and, most important of all, that God does all things well. As an Amish boy living on a small farm, Joel's life is different from many. Yet, many of his experiences and troubles are similar to most children - loneliness, sadness, joy, fun, chores and school. Joel and his brother face challenges and learn how to live to please God.